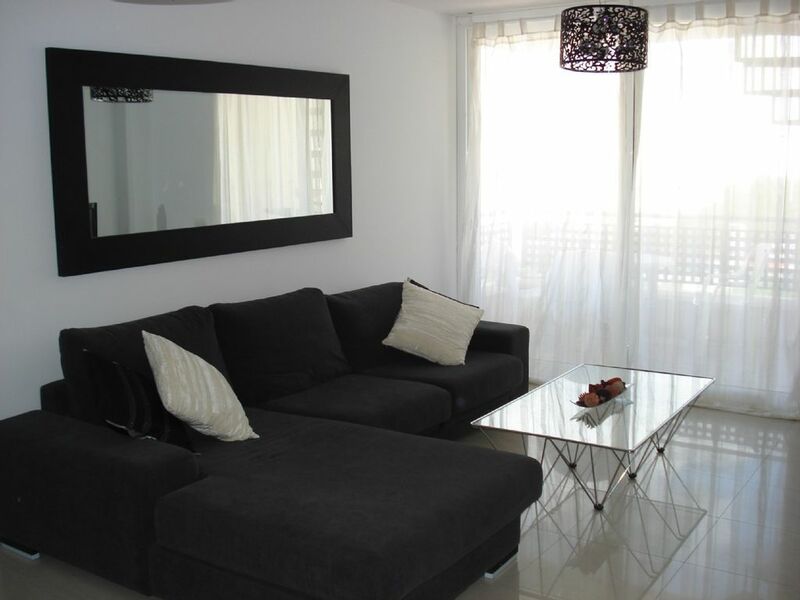 This spacious fully air conditioned apartment is set in a private complex, with a telephone entry system. It has two private pools including a children’s pool and is a ten minute walk to the beach, main shops and restaurants. It is perfectly situated just behind the busy resort of Playa d’en Bossa, by car the airport and Ibiza town are less than 10 minutes away. The stylish living and dining area includes flat screen television, dvd, stereo . This apartment features a large private roof terrace complete with dining table, chairs and sun loungers perfect for alfresco dining and private sun bathing, access is via a spiral staircase on the apartment balcony. The fully fitted kitchen is equipped with dishwasher, washing machine, fridge freezer and microwave. The master double bedroom with en-suite. Standard double (shares second bathroom). Twin bedroom (shares second bathroom). Lovely apartment with fantastic roof terrace and in a perfect location. Very clean and well maintained apartment with well equipped kitchen. There was a dishwasher, washing machine, hair-dryer and iron. Two modern bathrooms. Can’t recommend it enough. A great place to stay with family or friends, the rooftop terrace was great. We stayed with family for our daughter's wedding, it has plenty of seating area's, living room, terrace outside and amazing roof top terrace. The apartment is well equipped with plenty of parking outside, a short walk to Playa d'en Bossa or Ses Figueretes. There is a local Spar for all the essential's nearby or Lidl just a short drive away. So much easier than staying in a hotel. Also a short drive to the airport, which was handy as we had lots of trips to pick up and drop off family members. I would highly recommend this place! Very spacious, well maintained and clean with all equipment you need. The roof terrace was an amazing bonus! The apartment is close to the beach, restaurants and local Spar. It's based in quiet area so it is great for chilling out after parties away from the noise. Also contact was fantastic! Would definitely stay here again! The rep was waiting for us when we arrived and showed us round the apartment. 3 good size bedrooms, large lounge and fully fitted kitchen. Outside balcony and very large rooftop terrace with 6 sun beds. We stayed for 2 weeks in August 2017 4 adults and 2 teenagers. There was plenty of room for us all and the 2 bathrooms was an added bonus. The air con is the quietest I have known and simple to use. There is a large swimming pool and separate baby pool. For long periods of time we had the whole pool to ourselves. There are no sunbeds by the pool but we knew that before we arrived. The owner Stewart is extremely helpful during the booking process and provides lots of information on the apartment and the area. The town centre and beach is a 10 min walk and it will take you 30 min to walk into Ibiza Town. Alternatively you can get a taxi for about 8 euro. The full range of boat trips can be booked at the beach. There is enough to entertain all ages right on your doorstep, but you are far enough away not to be disturbed with loud music during the night. We had a wonderful holiday and would highly recommend this apartment. Finally thank you to Stewart for making the whole process simple and answering all my questions promptly. Near the lively resort of Playa d'en Bossa close to the Aguamar Water Park and the historic Dalt Vila.